Nemesis Enforcer is the right hand man of Golobulus, from the 1987 G.I. Joe animated movie. For context, you can first read the short Golobulus character profile. Base of Operations: Cobra-La, Himalayas. Height: 7′ Weight: 400 lbs. Age: Over 40,000. 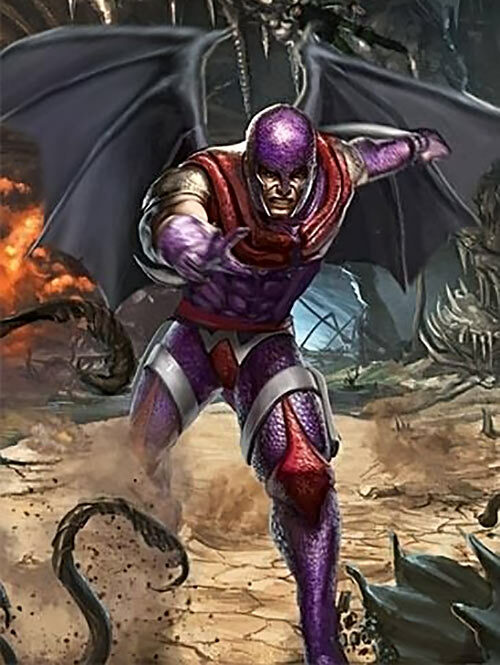 Nemesis Enforcer has low level superhuman strength, and large wings that allow flight. He has 24 foot span bat wings that he uses to fly, and claws along his forearms that can cut and bend steel. He also has armor that protects against any weapon known to be used by G.I.Joe. For at least 40,000 years, Nemesis Enforcer was the man Golobulus turned to for military or enforcement tasks. He was first seen capturing a couple of dozen G.I.Joes who’d pursued the Cobra Commander into Cobra-La. Enforcer “fetched” the fleeing Commander himself. Nemesis Enforcer subsequently took a hand in releasing Serpentor from G.I.Joe custody. Later, Golobulus sent him to capture the Cobra Commander again. The Commander was guiding G.I.Joe Roadblock out of Cobra-La. But Nemesis Enforcer only succeeded in blinding Roadblock, requiring the Commander to guide him verbally. Eventually, he opened the protective steel dome containing the Broadcast Energy Transmitter. But when Sergeant Slaughter fought him the second time, the Sarge threw him into a spiked pit opened by Golobulus. Nemesis Enforcer was never seen after that, but a being of his fortitude cannot be killed so easily. Nemesis Enforcer is a VERY tall man in a suit of lavender crustacean armor. Nemesis Enforcer is fiercely loyal to Golobulus. He will carry out any command he gives, believing in his soul that Golobulus’s will is the proper law for the universe. Area Knowledge: City [Cobra-La], Credentials (Cobra-La gov’t, Medium), Sharp Eye. Minor Physical Restriction (Cannot speak), Strange Appearance. 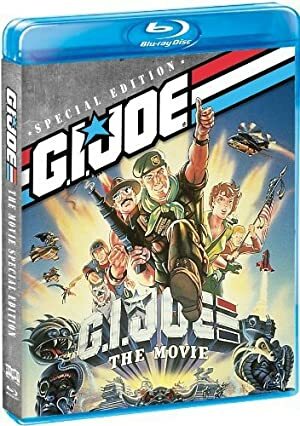 Source of Character: G.I.JOE: The Movie (1987), Character voiced by Peter Cullen. Writeup completed on the 6th of November, 2018.